A streamlined and entertaining twist on Nate Leipzig’s favorite effect Sympathetic Thirteen! 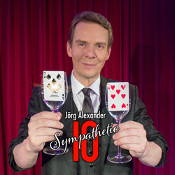 This is Jörg Alexander’s pet routine, finally published on DVD, with all necessary gimmicks! All you need are two wine glasses and a silk.